Not only are these Cranberry Oatmeal Orange and Spice Tea Muffins visually appealing but they are full of the flavors of Fall. 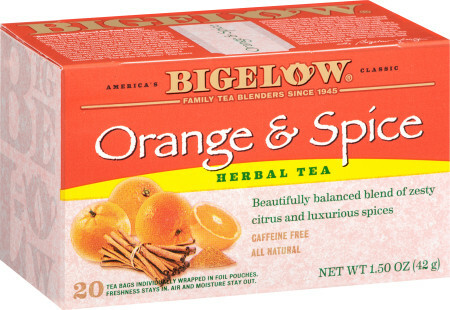 Made with aromatic brewed Orange and Spice Bigelow Tea. Take a deep breath in of the spicy deliciousness this tea has to offer. In a medium bowl add the oats, brewed tea, milk and orange zest. Stir to combine and set aside for 20 minutes. Place sliced cranberries in a small bowl, sprinkle 1 tablespoon sugar over cranberries and set aside. In a large bowl whisk together the sugar, flour, baking powder, baking soda and salt. Add the eggs and oil to the oatmeal mixture; stir to combine. Add the oatmeal mixture to the flour mixture; stir until combined. TIP: For regular size muffins use an ice cream scoop. For the larger size cupcake molds use 2 ice cream scoops. Bake regular size 20 to 25 minutes AND large 30 to 35 minutes. Add the tea 1 tablespoon at a time until it reaches a drizzle consistency. Use a large spoon and drizzle over muffins. May we suggest Cranberry Hibiscus Herbal Tea - Case of 6 boxes - total of 120 teabags to pair with this recipe?